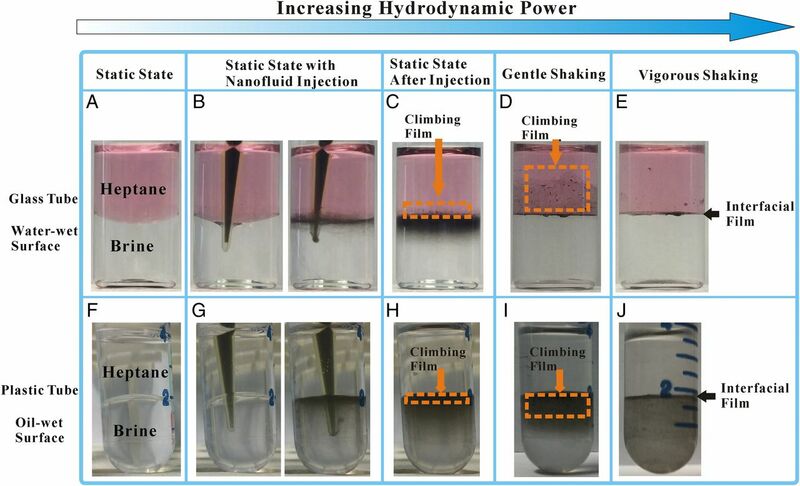 Behaviors of nanosheets in oil/brine system with increasing hydrodynamic power. As oil producers struggle to adapt to lower prices, getting as much oil as possible out of every well has become even more important, despite concerns from nearby residents that some chemicals used to boost production may pollute underground water resources. Researchers from the University of Houston have reported the discovery of a nanotechnology-based solution that could address both issues – achieving 15 percent tertiary oil recovery at low cost, without the large volume of chemicals used in most commercial fluids. The solution – graphene-based Janus amphiphilic nanosheets – is effective at a concentration of just 0.01 percent, meeting or exceeding the performance of both conventional and other nanotechnology-based fluids, said Zhifeng Ren, MD Anderson Chair professor of physics. Janus nanoparticles have at least two physical properties, allowing different chemical reactions on the same particle. The low concentration and the high efficiency in boosting tertiary oil recovery make the nanofluid both more environmentally friendly and less expensive than options now on the market, said Ren, who also is a principal investigator at the Texas Center for Superconductivity at UH. He is lead author on a paper describing the work, published June 27 in the Proceedings of the National Academy of Sciences. ("Nanofluid of graphene-based amphiphilic Janus nanosheets for tertiary or enhanced oil recovery: High performance at low concentration"). In addition to Ren, researchers involved with the project include Ching-Wu “Paul” Chu, chief scientist at the Texas Center for Superconductivity at UH; graduate students Dan Luo and Yuan Liu; researchers Feng Wang and Feng Cao; Richard C. Willson, professor of chemical and biomolecular engineering; and Jingyi Zhu, Xiaogang Li and Zhaozhong Yang, all of Southwest Petroleum University in Chengdu, China. The U.S. Department of Energy estimates as much as 75 percent of recoverable reserves may be left after producers capture hydrocarbons that naturally rise to the surface or are pumped out mechanically, followed by a secondary recovery process using water or gas injection. Traditional “tertiary” recovery involves injecting a chemical mix into the well and can recover between 10 percent and 20 percent, according to the authors. But the large volume of chemicals used in tertiary oil recovery has raised concerns about potential environmental damage. “Obviously simple nanofluid flooding (containing only nanoparticles) at low concentration (0.01 wt% or less) shows the greatest potential from the environmental and economic perspective,” the researchers wrote. Previously developed simple nanofluids recover less than 5 percent of the oil when used at a 0.01 percent concentration, they reported. That forces oil producers to choose between a higher nanoparticle concentration – adding to the cost – or mixing with polymers or surfactants. In contrast, they describe recovering 15.2 percent of the oil using their new and simple nanofluid at that concentration – comparable to chemical methods and about three times more efficient than other nanofluids. Dan Luo, a UH graduate student and first author on the paper, said when the graphene-based fluid meets with the brine/oil mixture in the reservoir, the nanosheets in the fluid spontaneously go to the interface, reducing interfacial tension and helping the oil flow toward the production well. Ren said the solution works in a completely new way. “When it is injected, the solution helps detach the oil from the rock surface,” he said. Under certain hydrodynamic conditions, the graphene-based fluid forms a strong elastic and recoverable film at the oil and water interface, instead of forming an emulsion, he said. Researchers said the difference is due to the asymmetric property of the 2-dimensional material. Nanoparticles are usually either hydrophobic – water-repelling, like oil – or hydrophilic, water-like, said Feng Wang, a post-doctoral researcher who shared first author-duties with Luo.